Who in the world plays SanGuoSha? It's funny that YOKA decided to include her in the game. This is one person that barely had ANY airtime at all. Maybe its because she is Liu Bei 刘备's wife, therefore they should throw her in there. But honestly, that's as silly as Scharzenegger's wife to play a supporting role in Terminator 6. Ok, so what DO we know about her? Well... she's Liu Bei's wife... and I have already said that. She is... a female... and... err... there's some stuff about her being escorted by so-and-so while Liu Bei was being defeated. Oh nevermind!! Let's just get on to the juicy bit! Character ability 1: "Prudence 淑慎 (shū shèn) "
Whenever you regain 1 unit of health, you can let another player of your Kingdom to draw 1 card. Character ability 2: "Divine Wisdom 神智 (shén zhì) "
At the beginning of your turn, you can discard all your on-hand cards. If by doing so, the number of your discarded cards is not smaller than X, you regain 1 unit of health (X equals to your current health). She is a brand new character specially created for Kingdom Wars. The initial criticism we had was what a retarded ability she has to give up all her cards. Well, not quite as retarded. She is definitely a support role and can be pretty hard-to-kill. Come on, she only needs to discard ONE card at the start of her turn if she only has 1 unit of health. Then she starts her turn with 2 units of life AND can ask someone else to draw a card. She's much more fun than Zhou Tai 周泰! “Prudence” came from Zhuge Liang 诸葛亮’s speech about her. This ability was similar to the beneficial part of Fa Zheng’s “Reciprocation” before change. 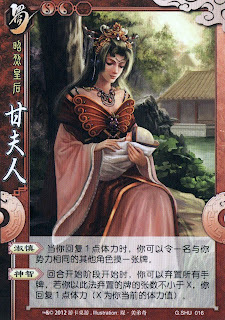 It is likely referring to the fact that Lady Gan was saved frequently, and she would repay her allies by letting them to draw a card. “Divine Wisdom” came from a folktale about Lady Gan. It was said that the skin of Lady Gan was pale and clear as jade. When Liu Bei acquired a jade figure, he put it in the room of Lady Gan and compared it to Lady Gan’s skin. However, Lady Gan advised Liu Bei to concentrate in his aspiration, instead of indulging in playthings. As a result, she was praised by the ministers of Shu Kingdom as “The Lady of Divine Wisdom 神智妇人”.